Background: Spinal anesthesia using low doses of local anesthetics with opioids is emerging as a useful technique for day care surgeries. Levobupivacaine, a lesser toxic enantiomer of bupivacaine, has now been increasingly used in various gynecological surgeries. However, its use has not been demonstrated in medical termination of pregnancy (MTP) with sterilization (a kind of day care surgery). This study was performed to compare analgesic and anesthetic effectiveness of low-dose hyperbaric 0.5% levobupivacaine and hyperbaric 0.5% bupivacaine in combination with fentanyl in spinal anesthesia in patients undergoing MTP with sterilization. Methods: A comparative, randomized, double-blind study was conducted in 90 patients scheduled to undergo elective MTP with sterilization. Group levobupivacaine (L) (n = 45) received 7.5 mg (1.5 mL) of 0.5% isobaric levobupivacaine + 1 mL of 5% dextrose and fentanyl 25 mcg (0.5 mL), while group bupivacaine (B) (n = 45) received 7.5 mg (1.5 mL) of 0.5% hyperbaric bupivacaine + 1 mL of normal saline and fentanyl 25 mcg (0.5 mL). They were compared with respect to onset and duration of sensory and motor block, time to reach highest sensory level, time to two segments' regression, and total duration of analgesia. Results: Sensory and motor block onset and time to achieve highest level of sensory block were significantly delayed in group L (P < 0.05). Duration of sensory block and duration of analgesia was longer in group L than group B. Motor block duration was significantly shorter in L group (88.4 ± 12.4 min in group L and 133.9 ± 28.1 min in group B). Both groups were comparable in terms of hemodynamic parameters and adverse effects. Conclusion: This study suggests that 7.5 mg of 0.5% levobupivacaine usage in spinal anesthesia provides longer duration of analgesia and better sensory blockade with minimal motor block when compared with 0.5% bupivacaine along with fentanyl and may be a better alternative to bupivacaine in day care surgeries. Spinal anesthesia is one of the anesthesia technique for medical termination of pregnancy (MTP) with sterilization. It offers the advantage of patient being awake, oriented, breathing spontaneously, reduced postoperative pain, minimal postoperative nausea vomiting (PONV), and fast-track recovery and has emerged as a useful technique for day care surgeries., For sterilization procedure, sensory level of at least T5–T6 is necessary to prevent discomfort from peritoneal traction, but increasing the dose of long-acting local anesthetics may produce extensive sensory and motor block as well as hypotension and this might result in delayed discharge from hospital. Long-acting amide local anesthetics such as bupivacaine are used at low doses for outpatient spinal anesthesia., Levobupivacaine is the S(-)-enantiomer of bupivacaine and is less toxic to heart and central nervous system. It produces less motor block than bupivacaine when administered intrathecally at low doses. Intrathecal fentanyl added to low-dose local anesthetics produces a synergistic effect without increasing the sympathetic block or delaying discharge. The aim of the study was to compare anesthetic and analgesic efficacy of low-dose hyperbaric levobupivacaine versus bupivacaine along with fentanyl in subarachnoid block in MTP with sterilization surgery. We hypothesize that levobupivacaine provides similar duration of analgesia without affecting duration of sensory and motor block when compared with bupivacaine. This study was performed from February 2013 to January 2014. The study was registered with the Clinical Trials Registry of India (CTRI) with CTRI number 2016/12/007516. After obtaining permission from the institutional ethical committee and written informed consent from the patients, this randomized, double-blind study was conducted in 90 patients. Inclusion criteria were american society of anesthesiologists (ASA) physical status I–II females between 20 and 50 years of age, weighing between 40 and 70 kg, and height >145 cm scheduled to undergo elective MTP with sterilization (tubal ligation) with gestation maximum up to 12 weeks. Patients with uncontrolled hypertension, infection at the injection site, disorders of coagulation, history of headache, reluctance to the procedure, neurologic disease, or hypersensitivity to amide local anesthetics or fentanyl were excluded from the study. All patients underwent a thorough preanesthetic checkup at least 24 h prior to surgery and were advised fasting 6 h before the procedure. Visual Analog Scale (VAS) was explained to patients. In operation theater, electrocardiograph, noninvasive blood pressure (NIBP), and pulse oximeter were attached, and preoperative baseline readings of NIBP, pulse rate (PR), and oxygen saturation (SpO2) were noted. A wide bore cannula was secured and preloading was done with Ringer lactate at 10 mL/kg. Patients were randomly allocated to two groups using computer-generated random number table and numbers concealed in opaque envelope to be opened after recruitment. This trial was so planned that neither the doctor nor the participant was aware of the group allocation and the drugs received. Group A (n = 45) received 7.5 mg (1.5 mL) of 0.5% isobaric levobupivacaine (Levo-Anawin-Neon Laboratories Limited, Palghar Maharashtra, India) +1 mL of 5% dextrose and fentanyl 25 mcg (0.5 mL), while group B (n = 45) received 7.5 mg (1.5 mL) of 0.5% hyperbaric bupivacaine (Anawin Heavy-Neon Laboratories Limited, Palghar Maharashtra, India) +1 mL of normal saline and fentanyl 25 mcg (0.5 mL) making a total volume of 3 mL each. The intrathecal drugs were prepared by an independent anesthesiologist not involved in the conduct of case as per randomization and administered by another anesthesiologist blinded to group allocation. Under all aseptic precautions, spinal anesthesia was performed in the operating room at the L3–L4 or L2–L3 interspace, with the patient in the left lateral position. A total volume of 3 mL was injected slowly through a 25-G spinal needle. The patient was placed in supine position with a slight head down tilt immediately after spinal injection to achieve block level of T6. Intraoperative vitals (blood pressure, PR, saturation and respiratory rate) were recorded at 2, 5, 10, 15, 30, 40, 50, 60 min, and postoperatively at 30 min interval or until rescue analgesic was given. The primary outcome measure was comparison of analgesic efficacy of low-dose intrathecal levobupivacaine (7.5 mg) versus bupivacaine (7.5 mg) when combined with fentanyl 25 mcg. Secondary outcome measures were to compare sensory and motor block characteristics and hemodynamic effects of low-dose (7.5 mg) hyperbaric levobupivacaine (0.5%) and bupivacaine (0.5%) when they were combined with fentanyl (25 μg) in spinal anesthesia for MTP with sterilization surgery. Total duration of analgesia was defined as time from intrathecal administration of drugs to patient's demand of rescue analgesic or VAS >3. It was recorded following pain scoring system – VAS. The VAS consisted of a 10-cm horizontal paper strip with two endpoints labeled 0 = “No pain” and 10= “Worst pain ever.” VAS was serially assessed after completion of surgery at half an hour interval till 300 min or till the patient complained of pain (VAS >3). Patient's VAS >3 and administration of rescue analgesia constituted the end point of the study. Inj. diclofenac (75 mg) IV through infusion was given as rescue analgesic and 100 mg inj. tramadol IV through infusion if required. The level of sensory block was tested by pinprick bilaterally at mid-clavicular line which was done every 2 min after spinal injection until it stabilized for three consecutive tests, and then every 15 min until S2 segment regression was achieved. “Onset of sensory block” was taken as the time taken to attain sensory level of T10 dermatome. Degree of motor block was assessed using modified Bromage scale (0: Able to move the hip, knee and ankle, 1: Unable to move the hip but is able to move the knee and ankle, 2: Unable to move the hip and knee but is able to move the ankle, 3: Unable to move the hip, knee, and ankle) “Onset of motor block” was taken as the time taken to achieve Bromage scale 1 from the time of subarachnoid injection. “Onset of highest motor block” was recorded as time to reach highest scale of motor block (Bromage scale 2/3). “Motor block duration” was recorded as time to complete termination of motor block (Bromage scale 0). “Maximum motor block level” was recorded as highest motor block scale (Bromage scale) that was reached. Side effects recorded were hypotension (mean arterial pressure <60 mmHg or greater than 25% below the baseline), bradycardia (pulse <50/min), respiratory depression (oxygen saturation less than 90% or respiratory rate ≤8/min), and pruritus. Episodes of intraoperative hypotension were managed with crystalloids 5 mL/kg, colloids, and if required with bolus doses of inj. mephenteramine 6 mg intravenously. Bradycardia was treated with 0.01 mg/kg of inj. atropine intravenously. Intraoperative nausea was treated with inj. ondansetron 4 mg and any pruritus was treated using antihistaminics. Oxygen (3 L/min) through face mask was applied if pulse oximeter reading decreased below 90%. The surgical technique used was dilation and evacuation in lithotomy position followed by tubal ligation through minilaparotomy approach through suprapubic incision in supine position. On completion of the surgery, the patients were shifted to the recovery unit. These patients were discharged home once the complete resolution of motor and sensory blockade was achieved and they were able to stand on their feet with minimal or no assistance. Statistical assessment of data was done using Statistical Package for the Social Sciences statistical software (version 17.0). The calculation of the required sample size was based on the mean and standard deviation (SD) of time to first rescue analgesia requirement after spinal anesthesia with bupivacaine (305 ± 50 min) and levobupivacaine (389 ± 189 min) as reported in previous trial, and 36 patients were required for each group to reject null hypothesis of equality of means of two groups with alpha = 5% and power (1- β) = 90%. A total of 95 patients were assessed for eligibility and after exclusion and dropouts, 90 patients were analyzed (45 per group). Independent sample t-test was used to assess some of the demographic data (age, weight, and height), time to reach T10 dermatome, time to achieve highest sensory level, time to two segments' regression, time to onset of motor block, motor block regression time, and time to first dose of rescue analgesic. The changes in blood pressure and heart rate over time were tested with analysis of variance for repeated measures. Categorical variables such as ASA physical status and complications were analyzed by Chi-square test of significance. A value of <0.05 was considered significant and <0.001 was considered highly significant. Data were expressed as mean ± SD or median (range) or number of patients (n) or percentage (%). A total of 90 patients were analyzed in the study. Two patients in levobupivacaine group failed to achieve adequate surgical block within 30 min after spinal injection and performed under GA, and therefore withdrawn from the study. One patient in bupivacaine group had bladder perforation in which surgery was prolonged and GA had to be given, and therefore excluded from the study. The two groups were comparable with respect to age, gender, weight, height, ASA grade, and duration of surgical procedure [Table 1]. The duration of analgesia was significantly prolonged in levobupivacaine–fentanyl group than bupivacaine–fentanyl group (P < 0.05). Sensory and motor block onset and time to achieve highest level of sensory block were delayed in group L (levobupivacaine) when compared with group B (bupivacaine) with P value <0.05 (significant). Duration of sensory block was also longer in group L than group B. On the other hand, duration of motor block was significantly shorter in levobupivacaine group (P < 0.001) [Table 2]. There was no significant difference in terms of two segments' regression time and highest level of sensory block in both groups [Table 2]. T6 was the highest level of block achieved in a majority of patients in both groups, whereas few patients also achieved T8 level of block. There was highly significant difference in maximum motor block achieved. 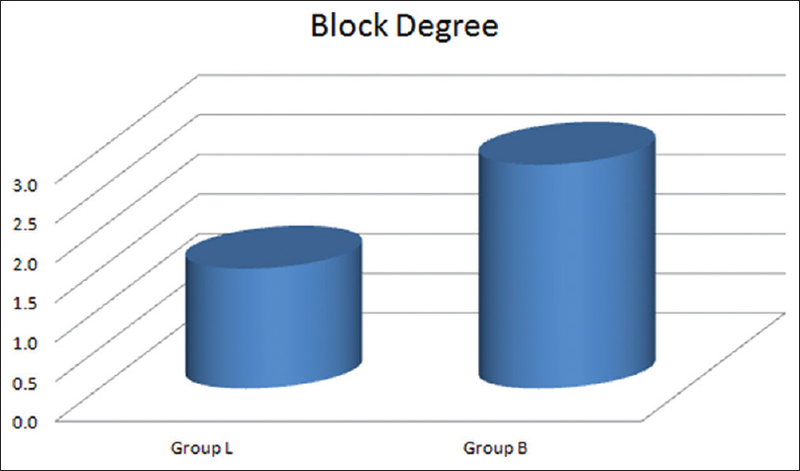 In group B, The percentage of patients with complete motor block (Bromage scale 3) was significantly higher than group L (P < 0.001) [Table 3] and [Figure 1]. Both groups were comparable with respect to mean arterial blood pressure, heart rate, and SpO2 values over different time intervals [Figure 2] and [Figure 3]. There was no significant fall in MBP in both groups at any time interval. There was no significant difference in the incidence of side effects (e.g. hypotension, bradycardia, nausea, vomiting, shivering, pruritus) in both groups (P > 0.05) [Table 4]. We observed that 7.5 mg 0.5% hyperbaric levobupivacaine in spinal anesthesia can provide adequate sensory blockade with minimal motor block with longer duration of analgesia and stable hemodynamic profile when compared with similar dose and concentration of bupivacaine in MTP with sterilization surgery. Comparison of levobupivacaine and bupivacaine has been performed in various studies, but the results of them are inconsistent. Some studies have demonstrated equal effectiveness of levobupivacaine and bupivacaine, whereas others have shown different block characteristics. This is the first study performed in MTP with sterilization surgery which is a type of ambulatory day care surgery. Low-dose spinal anesthesia has been performed in this study which is the practice of using minimal dosing of intrathecal drugs to ensure that only the nerve roots supplying the specific area get blocked. According to a meta-analysis of 12 studies performed in 693 patients, a cut-off value was defined for “conventional dose” as >8 mg bupivacaine (which many would consider a low cut-off value) and “low dose” <8 mg.
We have used hyperbaric solutions of levobupivacaine and bupivacaine in our study. Since literature describes use of various concentrations (mg/mL) of dextrose (3%–50%) to make solutions hyperbaric, we have used minimally concentration of dextrose (5%) using readily available solution to make levobupivacaine hyperbaric. We performed specific gravity testing on the mixtures before starting the study. The values of specific gravity of solutions were 1.015 in group L and 1.020 in group B, at 25°C respectively. As the specific gravity of cerebrospinal fluid (CSF) ranges from 1.0063 to 1.0075 and the mean CSF density of pregnant women was found to be 1.00033 ± 0.00010 g/mL, both solutions were hyperbaric compared with CSF. This study demonstrated longer duration of analgesia and longer duration of sensory block in levobupivacaine–fentanyl group. It may be related to vasoconstrictive properties of levobupivacaine at lower doses than bupivacaine. Consistent with our study, Hakan Erbay et al.and Erkili et al. found that first analgesic requirement and duration of sensory block were longer in levobupivacaine than bupivacaine group. Long duration of sensory block in levobupivacaine group was also observed by Casati et al. In contrast to this, Mehta et al., Lee et al., and Misirlioglu et al. have demonstrated similar sensory block characteristics, whereas Duggal et al. have revealed shorter duration of sensory block in levobupivacaine group which may be related to the fact that they have used isobaric levobupivacaine to compare with hyperbaric bupivacaine. Studies performed by Misirlioglu et al., Erdil et al.,and Vellosillo et al. showed results similar to the present finding of delayed time to reach T10 level and highest level of sensory block in levobupivacaine group which again may have been the result of the vasoconstrictor properties of levobupivacaine. The duration of the block is dependent on the type of the drug used and the volume. In our study, the effective concentration of the local anesthetic in both the groups was 0.25% and the volume was limited to 3 mL for both. Thus, the only difference was characteristic of the drug used. We found no significant difference in two segments' regression time and highest level of block achieved in both the groups (P > 0.05). In 2006, Vanna et al. studied 70 patients undergoing elective transurethral endoscopic surgery who received 2.5 mL of either 0.5% isobaric levobupivacaine (n = 35) or 0.5% hyperbaric bupivacaine (n = 35) intrathecally and found that two groups were similar in terms of time to block suitable for surgery, duration of sensory block, time to two segments' regression, and time to T12 regression. In a recent study by Dar et al., 2 mL each of isobaric levobupivacaine 0.5% and hyperbaric bupivacaine 0.5% in combination with fentanyl 15 mcg were compared in spinal anesthesia in cesarean section and there was no significant difference in time to achieve highest level of block, two segment regression times, and incidence of side effects. Our findings of delayed onset and short duration of motor block in levobupivacaine group are in congruence with Hakan Erbay et al. and Duggal et al. Erdil et al.also illustrated delayed onset in group L, but similar degree and duration of motor block between two groups. Studies performed by Lee et al. and Alley et al. demonstrated no difference in motor block characteristics between levobupivacaine and bupivacaine. We observed lesser percentage of patients with complete motor block in levobupivacaine group when compared with bupivacaine group. This was probably because levobupivacaine is less potent than bupivacaine. In the study of Camorcia et al.,the potencies for motor block of intrathecal ropivacaine, levobupivacaine, and bupivacaine were compared, and weaker motor block potency and shorter duration of motor block were reported with levobupivacaine group. Dar et al. also observed that regression time of motor block was significantly lesser in levobupivacaine group correlating with this study. No clinically significant changes were observed in hemodynamic parameters (heart rate, mean blood pressure, peripheral oxygen saturation) throughout our study, and complications (hypotension, bradycardia, PONV, pruritus, shivering) were minimal and comparable in both groups. This may be related to usage of low doses of local anesthetics. There are certain limitations to our study. The sample size taken is small. Its implementation to a larger population group will need further research. In addition, since levobupivacaine was made hyperbaric by addition of 5% dextrose, whereas bupivacaine taken had 8% dextrose, the difference in the spinal characteristics may have been in part related to the difference in dextrose concentrations. To conclude, 7.5 mg of hyperbaric levobupivacaine in addition to 25 mcg fentanyl provides adequate level of sensory blockade, with significantly lesser duration of motor blockade and longer duration of analgesia compared with similar dose of hyperbaric bupivacaine with the only disadvantage of delayed onset of sensory block. In addition, low-dose levobupivacaine leads to a better hemodynamic profile compared with similar doses of bupivacaine. Thus, low-dose levobupivacaine plus fentanyl may be a better alternative to bupivacaine plus fentanyl owing to its longer duration of sensory block, good postoperative analgesia, and lesser degree and shorter duration of motor block allowing early ambulation and faster discharge. The authors would like to thank Dr. Mamta Khandelwal and Dr. Sushil Bhati for helping in completing this work. Association of Obstetric Anaesthesiologists. The Association of Obstetric Anaesthesiologists guidelines for anaesthetic management of patients undergoing tubal ligation. J Obstet Anaesth Crit Care 2011;1:1-2. Harsoor S. Changing concepts in anaesthesia for day care surgery. Indian J Anaesth 2010;54:485-8. Kulkarni S, Harsoor SS, Chandrasekar M, Bhaskar SB, Bapat J, Ramdas EK, et al. Consensus statement on anaesthesia for day care surgeries. Indian J Anaesth 2017;61:110-24. Korhonen AM. Use of spinal anaesthesia in day surgery. Curr Opin Anaesthesiol 2006;19:612-6. Cappelleri G, Aldegheri G, Danelli G, Marchetti C, Nuzzi M, Iannandrea G, et al. Spinal anesthesia with hyperbaric levobupivacaine and ropivacaine for outpatient knee arthroscopy: A prospective, randomized, double-blind study. Anesth Analg 2005;101:77-82. Casati A, Moizo E, Marchetti C, Vinciguerra F. A prospective, randomized, double-blind comparison of unilateral spinal anesthesia with hyperbaric bupivacaine, ropivacaine, or levobupivacaine for inguinal herniorrhaphy. Anesth Analg 2004;99:1387-92. Bajwa SJ, Kaur J. Clinical profile of levobupivacaine in regional anesthesia: A systematic review. J Anaesthesiol Clin Pharmacol 2013;29:530-9. Camorcia M, Capogna G, Berritta C, Columb MO. The relative potencies for motor block after intrathecal ropivacaine, levobupivacaine, and bupivacaine. Anesth Analg 2007;104:904-7. Akan B, Yagan O, Bilal B, Erdem D, Gogus N. Comparison of levobupivacaine alone and in combination with fentanyl and sufentanil in patients undergoing transurethral resection of the prostate. J Res Med Sci 2013;18:378-82. Luck JF, Fettes PD, Wildsmith JA. Spinal anaesthesia for elective surgery: A comparison of hyperbaric solutions of racemic bupivacaine, levobupivacaine, and ropivacaine. Br J Anaesth 2008;101:705-10. Hakan Erbay R, Ermumcu O, Hanci V, Atalay H. A comparison of spinal anesthesia with low-dose hyperbaric levobupivacaine and hyperbaric bupivacaine for transurethral surgery: A randomized controlled trial. Minerva Anestesiol 2010;76:992-1001. Arzola C, Wieczorek PM. Efficacy of low-dose bupivacaine in spinal anaesthesia for caesarean delivery: Systematic review and meta-analysis. Br J Anaesth 2011;107:308-18. Sanansilp V, Trivate T, Chompubai P, Visalyaputra S, Suksopee P, Permpolprasert L, et al. Clinical characteristics of spinal levobupivacaine: Hyperbaric compared with isobaric solution. ScientificWorld Journal 2012;2012:169076. Günaydin B, Güngör İ, İzdeş S. Final baricity of ropivacaine or bupivacaine combined with fentanyl for intrathecal administration. Turk J Med Sci 2012;42:942-5. Mehta A, Gupta V, Wakhloo R, Gupta N, Gupta A, Bakshi R, et al. Comparative evaluation of intrathecal administration of newer local anaesthetic agents ropivacaine and levobupivacaine with bupivacaine in patients undergoing lower limb surgery. Internet J Anesthesiol 2007;17:17. Lee YY, Muchhal K, Chan CK. Levobupivacaine versus racemic bupivacaine in spinal anaesthesia for urological surgery. Anaesth Intensive Care 2003;31:637-41. Misirlioglu K, Sivrikaya G, Hanci A, Yalcinkaya A. Intrathecal low-dose levobupivacaine and bupivacaine combined with fentanyl in a randomised controlled study for caesarean section: Blockade characteristics, maternal and neonatal effects. Hippokratia 2013;17:262-7. Duggal R, Kapoor R, Moyal G. A comparison of intrathecal levobupivacaine with hyperbaric bupivacaine for elective cesarean section: A prospective randomized double-blind study. J Obstet Anaesth Crit Care 2015;5:78. Erdil F, Bulut S, Demirbilek S, Gedik E, Gulhas N, Ersoy MO, et al. The effects of intrathecal levobupivacaine and bupivacaine in the elderly. Anaesthesia 2009;64:942-6.
del-Rio-Vellosillo M, Garcia-Medina JJ, Abengochea-Cotaina A, Pinazo-Duran MD, Barbera-Alacreu M. Spinal anesthesia for knee arthroscopy using isobaric bupivacaine and levobupivacaine: Anesthetic and neuroophthalmological assessment. Biomed Res Int 2014;2014:349034. Vanna O, Chumsang L, Thongmee S. Levobupivacaine and bupivacaine in spinal anesthesia for transurethral endoscopic surgery. J Med Assoc Thai 2006;89:1133-9. Dar FA, Mir IH, Bhat HA. Comparison of intrathecal hyperbaric bupivacaine and levobupivacaine for cesarean section. Ain Shams J Anaesthesiol 2015;8:89. Alley EA, Kopacz DJ, McDonald SB, Liu SS. Hyperbaric spinal levobupivacaine: A comparison to racemic bupivacaine in volunteers. Anesth Analg 2002;94:188-93.